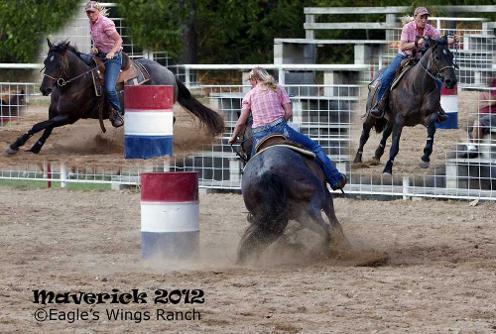 I offer barrel racing and pole bending training for horses that are at least green broke. 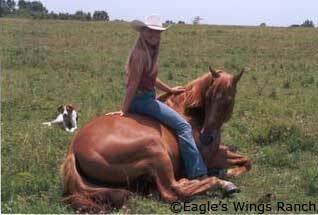 I can also fix problems a barrel horse is having on the pattern. I also put refreshers and tuning on horses that just haven't been ridden in a while or might just need a little more handle put on them such as neck reining, lateral movements, collection, flexion, etc. I have been training horses professionally since 1998. I use traditional and natural horsemanship training techniques. I keep up to date on new ideas and techniques through clinics, programs, and publications. I believe in teaching a horse to be a willing partner, not using pain or fear to teach. I do ground work to make sure the foundation is right and throughout training I take it at the pace that they are able to learn. I never force them to do something they aren't ready for. I will discipline them if they need it but only so they understand and never in a way that is detrimental to the learning process. All incoming horses must be current on vaccinations, have a current negative coggins, and be up to date on deworming. Out of state horses must have a health certificate current within 72 hours. Any horse that does not appear to be healthy upon arriving will not be allowed to stay. Training is $600 per month which includes full care board and a demonstration of the results of the training with one free lesson for the owner at the end of the training period. Weather permitting, I train at least 5-6 days per week. If I miss a day due to weather, it is added on at the end at no extra charge. Job 39:19 "Hast thou given the horse strength? Has thou clothed his neck with thunder?" Prov 21:31 "The horse is prepared against the day of battle: but safety is of the LORD."